Ditch Witch's MT12 has a floating saw shroud that follows the ground contour with constant pressure to help clean out the soil, producing a sharper-edged cut. For contractors looking to dig a small, shallow trench for fiber-optic lines leading to homes, using traditional digging methods can add time and additional cost to the project. Microtrenchers are primarily used for installing fiber-optic lines to homes. These lines are thinner and do not go as deep as other utilities. “The telecommunications industry is definitely a big driver in using microtrenching,” said Seabolt. The cost of fiber line installation is a big selling point for contractors using microtrenchers, as the price-per-home to install a gigabyte internet connection can be excessive using traditional trenching methods. Saw blades are the key to what makes the microtrencher different than other trenching equipment. 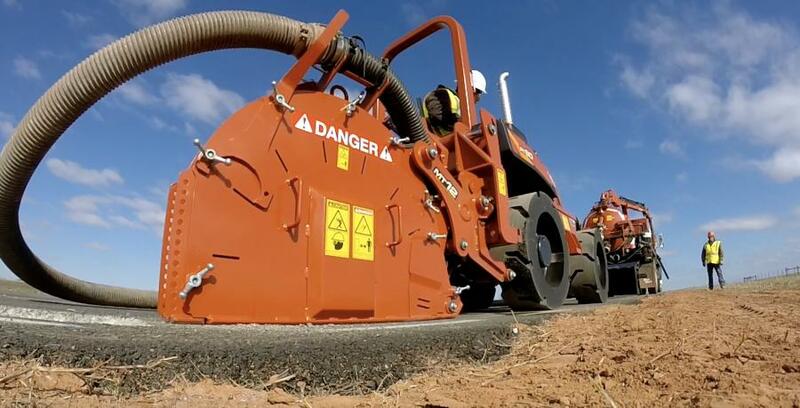 The small blades are designed to cut through asphalt or concrete, creating a trench in one quick pass. The smaller blade allows microtrenchers to trench in the public right-of-way next to curbs or gutters. Vermeer's microtrencher includes its Yellow Jacket cutter system that offers teeth with reversible edges, said Jason Zylstra, marketing manager of Vermeer. When an edge is worn, contractors can slip the tooth to access a new cutting edge to help lengthen tooth life and increase cutting time. Vermeer's rotary tooth configurations are compatible for wider cutting specifications and a shark tooth wheel is available for narrow cutting specifications. Microtrenchers include a hydraulic plunge to provide variable depth control, ranging from 6 to 12 inches, eliminating the need for contractors to manually adjust the equipment. They can also be manually tilted 6 degrees to the right or left, allowing contractors to maintain a true vertical trench on uneven surfaces. Microtrenchers also can be fitted with an attachment that easily removes spoils from the work site. Vermeer's cyclonic high cfm vacuum system is connected to the microtrencher with a 4-inch hose that simultaneously removes the material as it is cut, leaving a clean trench for placement of the fiber. Zylstra said it has a three-stage filtration system and can easily handle dry material. Once the trench is dug, it is backfilled with a grout compound.